In Australia, design standards for bulk materials handling machines such as stackers, reclaimers, ship loaders and ship unloaders are published and maintained by Standards Australia. AS4324.1 Mobile equipment for continuous handling of bulk materials – General requirements for the design of steel structures was introduced in 1995 in response to a number of failures of bulk materials handling machines within Australia. A revised edition of the standard was published in 2017. This Standard specifies general requirements, design loads and specific requirements for structures of mobile equipment for continuous handling of bulk materials, including appliances and machines that are intended to carry out similar functions (e.g. excavators, stackers, reclaimers, ship loaders, ship unloaders). The Australian Standard calls up other Australian Standards such as AS1170.2 for Wind Loads, AS3990 for permissible stress steel design and AS4100 for limit states steel design. AS4324.1 requires that fatigue design is carried out to AS4100. 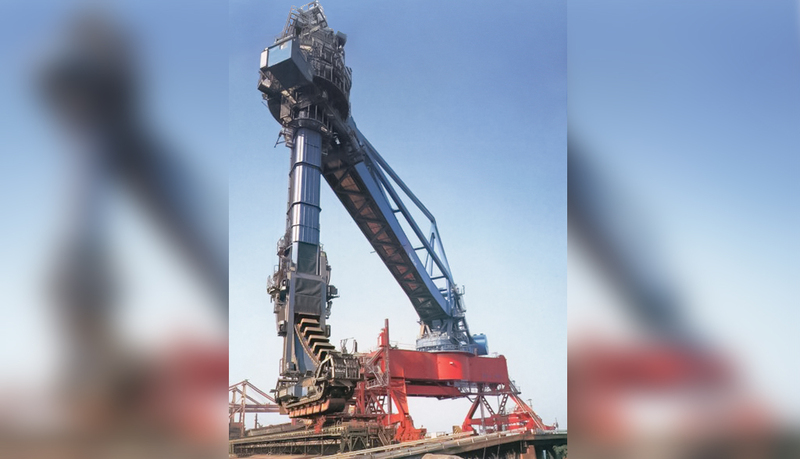 The International Standards Organisation has a published design standard for bulk materials handling machines such as stackers, reclaimers, ship loaders and ship unloaders (ISO5049.1-1980 & 1994). ISO5049.1 has been widely used internationally; however, its use has been discontinued in Australia since the introduction of AS4324.1 in 1995. Steel design requirements for strength and fatigue and wind loading are covered in ISO5049.1. However, these vary from Australian Standard requirements in a number of respects. There are significant differences between AS4324.1 and ISO5049.1. Generally, machines designed according to AS4324.1 are somewhat heavier than similar machines designed according to ISO5409.1. A tabulation of differences between AS4324.1 and ISO5049.1 is presented in Table 1. One of the major differences between the two Standards is with regards to designer interpretation. AS4324.1 is more prescriptive and gives detailed guidance on how to calculate the various load cases. ISO5049.1 has more scope for designer interpretation which can lead to a lighter design. Are dynamic effects considered in the design load cases? With ISO such effects are often neglected. Are the wind loads calculated according to AS1170.2? ISO5049.1 has its own methodology which is different from Australian Standards. For the case of a blocked chute, how is the case of a blocked chute and load due to excess material on the conveyor belt calculated? ISO is not prescriptive in this area which could lead to an underestimate. These can be collisions with an object on the tracks (travelling device obstructed), component collision with a ship (lateral collision of the boom) or collision of a machine with end buffers (buffers). How are the collision cases considered? AS4324.1 has more onerous requirements – refer to Table 1. If a major component on the machine were to fall off (such as the bucket elevator), will the machine be stable? AS4324.1 has more onerous requirements including the need for dynamic multipliers and need for restraints on open bearings. Are there two totally independent rope or stay systems? AS4324.1 requires this to improve safety. Is the steel design done according to Australian Standards? ISO5049.1 uses its own approach. Is the fatigue design done to AS4100? AS4100 reflects current practice for the design of welded steel structures subject to fatigue loads. ISO5049.1 follows an older methodology for fatigue design which is non-conservative. The Internation standard of ISO5049.1 was used in Australia until 1995 when the AS4324.1 standard was introduced. ISO5049.1 There are important differences between AS4324.1 and ISO5049.1 requirements. AS4324.1 is prescriptive and gives detailed guidance on how to calculate the various load cases and which load combinations to consider. ISO 5049.1 uses an outdated “mean stress” approach to fatigue design which is not adopted in modern standards such as AS4100 – called up in AS4324.1. ISO5049.1 is less onerous in its consideration of dynamic loads and collisions and does not reflect Australian experience with machine failures or additional requirements for redundancy of support systems. Knowing the maximum capacity of existing conveyors is crucial when owners and operators wish to increase the overall throughput of transporting systems. This article provides some insight on the processes behind determining the maximum capacity.